Hi everyone!! I hope my fellow American gals had a lovely Thanksgiving. I went Black Friday shopping for the first time. It's been a long time coming, lol. I was very much against the whole idea for a long time-- the crowds, the fights, the whole leaving your house at a ridiculous hour to go shopping-- but C kind of gets excited about it and has gone without me and had fun. Last year we were at my parents' house till almost midnight, so we decided to stop in at the Walmart on the way home to see just how crazy the scene at the most notorious Black Friday shopping spot really is. So after driving around waiting for a parking space to open up, we headed in, laughed at the madness and the lack of genuinely killer deals, and went home. 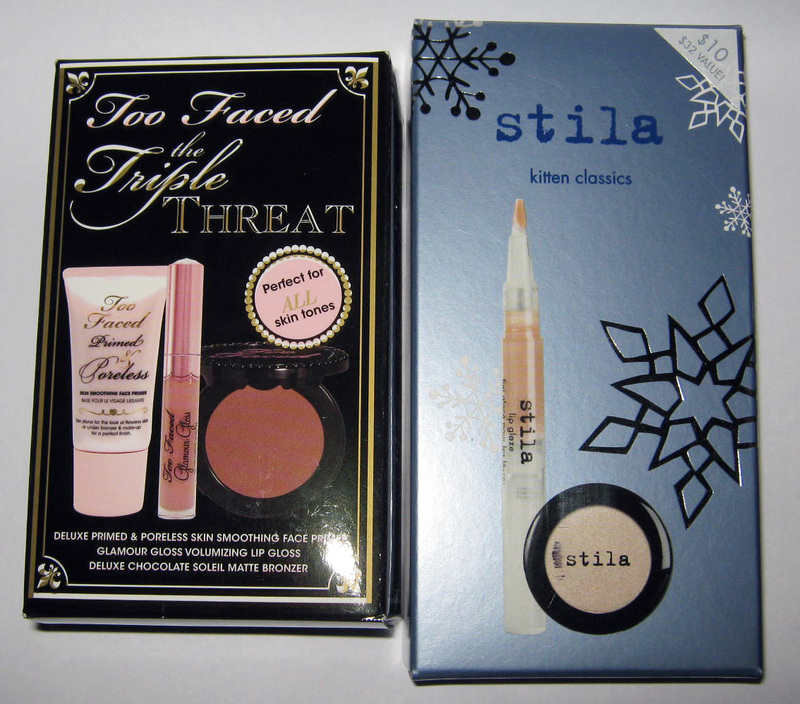 ... Stila Kitten Classics and Too Faced The Triple Threat, mini sets of both brands' top sellers. So, I get to try bronzer (the Too Faced compact in the upper middle) and primer for the first time and play around with some pretty layering shades, for the price of a drugstore find! I'm pretty excited about my little haul. My city isn't terribly huge and people were, for the most part, really cool. I even had a gal offer to grab me a Lorac eyeshadow palette if she saw them first. ;) Alas, my store apparently only received two, both of which were gone before the sale even began... hmmm.... They were sold out in no time online, too. We wanted to check out Old Navy afterward ($5 fleece, yo!!) but the line, an hour after they opened, reached to the end of the sidewalk, and to C's happiness, I decided hekk no on that one. So, home we went, after one store, and checked out some online deals, instead. Did anyone else go? What did you get? Know of someone who actually scored one of those Lorac palettes? You really went out with the hords??? Gads, I think I only have been maybe 2 times to the day after Xmas sales and never to a Black Friday shopping - I so hate crowds. I looked at all the ads I got on line - suprised how many places were running on line sales for Black Friday too and not waiting exclusively for Cyber Monday. Like you, we don't have much shopping where I live. I would need to drive quite a ways to get to just a place with Walmart, Target and they just put in an Old Navy - never been in one yet - but sounds like it was not the place to be on Black Friday! Still $5 fleece - only I have a ton of it I loaded up on last winter that will be fine this yr. that is if it ever gets cold! Cripes I was in shorts and a tshirt again yesterday and today going to be equally as warm. I am ready for the 28 degree nights and the 40 degree days. I can't believe it either, lol. The best part about it all is that Ulta's like, seven minutes away from our house, so getting there and back was no big deal. I will admit, about 20 minutes before the store opened, the line had gotten pretty long and I started to get a little skeered, lol. But, everything was fine and we were all pretty respectful of one another and just excited to be there. ;) It was a decent first experience. No, I haven't gone ever. I actually don't even look at the ads so I won't know what I am missing. 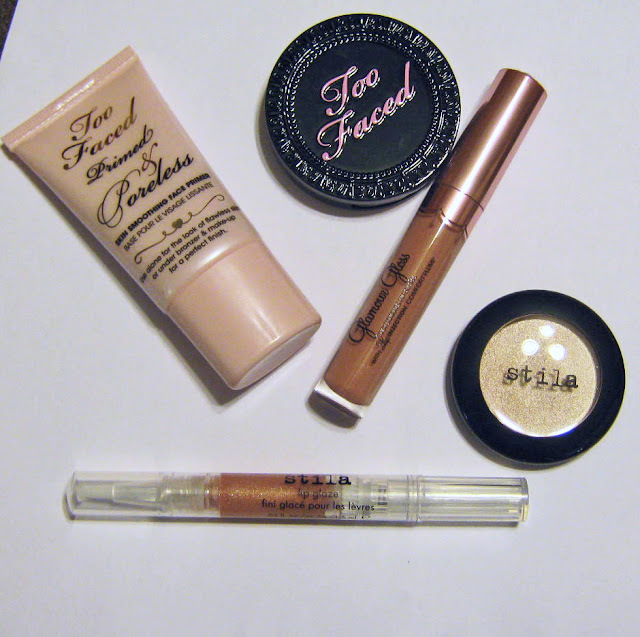 I use Too Faced Primed & Poreless and really like it. Great haul! I've never looked, either, because I've never cared. I just kind of got into it, this year :} Before we left I was bouncing around the house, all hyped up, lol. I'll probs go to Ulta again next year, it seems like it's a fun, relatively inexpensive way to play with some new things. I'm really excited to try the primer. I shopped online only, as usual. Oh Liesl, the amount if eyeshadow I've bought and Cyber Monday hasn't even gotten here yet. Haha! I hit Coastal Scents, MUG, and Lime Crime. I'm excited to see what sales Monday brings!! Dude, I cannot WAIT to see your hauls! !